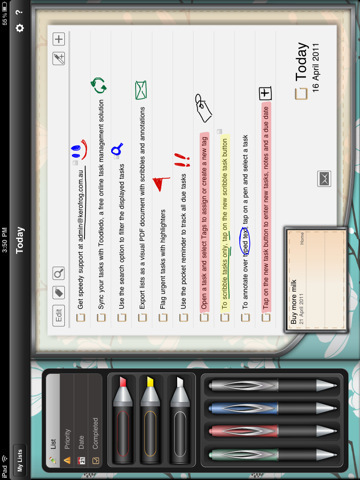 Developer Quote: "Manage is a powerful and beautifully designed todo/task management app for the iPad." You know the feeling of being overwhelmed by too many tasks, chores or activities? It's impossible to get a handle on those things that must be accomplished for you or your family. Some of you may write sticky notes, or even type them one at a time in your iDevice, but honestly you need a much more overall and comprehensive gathering of your thoughts and plans than that! Manage can help you achieve the sanity you crave in your overworked life. It's not just about lists. In fact, you get a collection of useful functions which are so simple to use that you won't dread organizing your life. Go ahead and sync your notes, make backups, perform searches and set tasks in sub categories! Let's take a look at some of the helpful, neat features of this iPad productivity app that soon you won't be able to do without! - Sync your tasks with Toodledo and access them anywhere with an internet connection. You can even sync your tasks with Microsoft Outlook. - Back up your data with the provided backup features. - Try different themes choosing from four, fun and free alternative designs. - Use a multi-level tags-based system that gives you full control over your tags. - Preview upcoming due tasks with the ‘Pocket Reminder’. 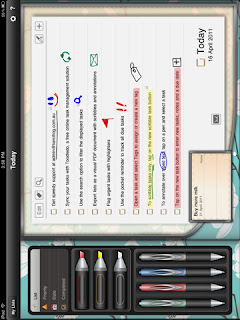 - Try out the ball-point pens to hand-write your tasks or to scribble notes over your typed tasks. - Manage supports advanced repeating tasks. Choose from customizable time frames or choose by the days of the week. -✔ Play with highlighters that can be used to highlight any of your tasks to mark them as urgent or important. - Create templates by using the ability to duplicate any list. - Conveniently export your lists (along with handwritten notes) and email them as a PDF. - Filter your lists using tags and sort methods. - Fluid dynamic icons that aren’t separated by fixed columns. - Touch the pen on the screen to start the drawing process. - Select a highlighter/marker to prioritize a task. The truth is that it would just take up too much space listing the many features of this customizable and flexible app. I like being able to "scribble" my own notes, as well as use the highlighter to differentiate and highlight tasks. That always helps me think more clearly. I also like being able to create my own templates based on my needs. So many features with a conveniently clean and simple interface makes play out of your work. COOL CONCLUSION: "Becoming organized is enjoyable, snappy-quick and so easy when you use the many-featured Manage iPad app." --iOS/Age Rating: This app requires iOS 4.2 or later. Rated 4+.